#7250 Smooshees Critter Cuddlers "Itty Bitty Kitty"
Description: The Itty Bitty Kitty set includes a Yellow Smooshee kitty cat, and a round hard plastic cat house that Kitty can be smooshed into. This is one of several friendly Smooshee pets called Critter Cuddlers that were sold with a natural habitat they can be smooshed into. Designed for children ages 4 years and older. 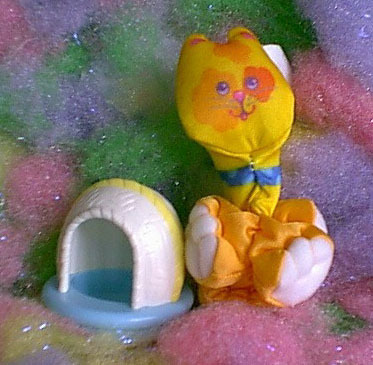 FPT14924 - Itty Bitty Kitty - Small yellow cloth stuffed Smooshee kitty cat with a printed face and other features. Kitty has a yellow head and body orange legs with white pads on the bottom of each foot, and a long yellow tail with white on the end. Kitty has a large orange circle around one eye, a small red circle around the other eye, a pink triangular nose, and a pink mouth with her tongue sticking out. Kitty wears a blue printed collar with light blue dots. 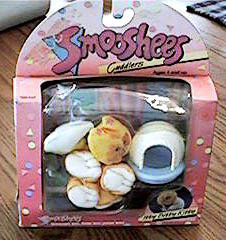 Kitty is not marked with a model number, but she was sold with a small sewn-on tag marked with a "S" for Smooshees. FPT14925 - Small rounded igloo-style cat house that a Smooshee can be smooshed into. The house has a round blue base and white dome top with a yellow band across the top and a small door opening on the side. Measures 2-1/8" diameter, 2" tall. Marked "©1987 FISHER-PRICE, HONG KONG" on the bottom.